Bridal preparations and the service at Christ Church. Covering Jessica and Nathan's wedding was a real privilege as a wedding photographer. The venue they had chosen was Ashfield House in the town of Wigan in Lancashire. I love photographing a wedding at Ashfield House as it's not too far from my home and over the years I've gotten to know the staff well and know they always put on a great wedding! It is a delight to work as a wedding photographer in such fantastic venues. All wedding stories begin with bridal prep and Jessica's story started at her parents home. 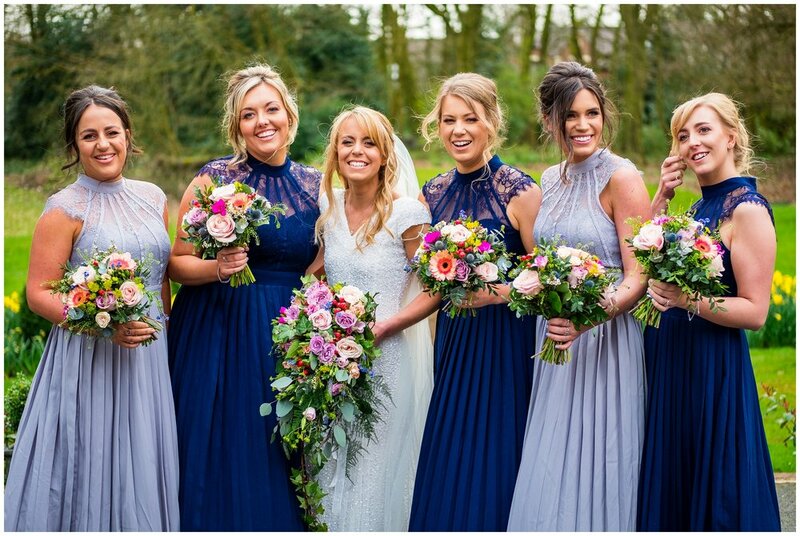 There was a lot of excitement as I photographed the bride and her bridal party during their hair and makeup session with drinks flowing and plenty of selfies! It's the perfect time to get to know the brides parents and her bridal party before the ceremony takes place and working in a documentary style I'm able to capture the morning naturally without staging anything so that their story really is their story. Whilst Nathan was hidden away inside the church greeting the guests Jessica had finished getting ready and was en route to the venue in a fantastic vintage car. Jessica and Nathan tied the knot at Christ Church in St Helens and it was a emotional ceremony amongst family and friends before heading over for their wedding reception. The wedding reception at Ashfield House, Lancashire. After the ceremony the wedding party enjoyed a lovely reception at Ashield House. The drinks flowed freely as the guest make their way through the wedding venue admiring it's character and charm. A huge selling point of the venue is it's simplicity with decor. The place has lot's of character but as it's painted white it doesn't over power you so that you're able to add any theme you want in there and it will work. Photographing the reception is always interesting and heartwarming as guests chat, laugh and have a good time. It's a great time to capture the natural photos. Just before the wedding breakfast I pinched Jessica and Nathan for some portraits around the grounds. The rain looked like it was threatening to appear as it was getting cloudy making the light very soft, which is great for photographs, so we made the most of the dry weather and got some stunning portraits around the grounds. I got them back in time to be announced into the room and then it was time for the speeches. They were moving, funny and had the room on a roller coaster of emotions! The evening was set to be full of entertainment with live music and a DJ to keep the party going well into the night. After a romantic first dance the dance floor was packed with everyone dancing and singing along to some pop / rock classics! It's a great time to capture everyone having an awesome time and to really capture some personalities. I knew it was going to be a fantastic wedding when Jessica and Nathan booked me to photograph it and I'm so glad they invited me along.